The daily routine of the Spaniards differs a bit from many other European peoples. 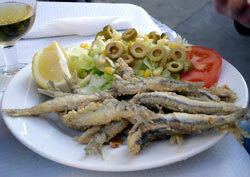 The principal meal is most often dinner, and the inhabitants of Malaga love to dine in tapas bars in the city centre. The most typical dishes of Malaga gastronomy are "pescaito frito" (fried fish: anchovies, scads, red mullet, octopus and calamary), noodle casserole, "gazpacho" (cold tomato-based raw vegetable soup), "gazpachuelo" (fish-based soup with mayonnaise), "migas" (fried breadcrumbs with further ingredients), "ensalada malagueña" (salad made of cooked potatoes, oranges, onions, cod and olives) as well as "porra" (soup similar to gazpacho, served cold with tuna, Iberian ham or eggs). Besides, Malaga is also famous for its sweet wines, the traditional rum and its brandy. On Fridays and Saturdays after dinner, which frequently ends around 11 pm or midnight, the Malagueños (inhabitants of Malaga) usually go clubbing in the city centre that offers a manifold facet of bars, restaurants and discotheques. 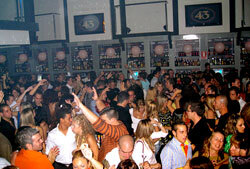 The majority of the locals are situated between Plaza Uncibay and Plaza de la Merced and tend to be frequented – other than the heterogenous club scene along the rest of the Costa del Sol - mostly by Spanish speaking people. For those who like to rest and spend the day at the sea, there are 16 beaches in Malaga of different quality and nature. The flat beaches west and east of the port, between Guadalmar, Huelin, La Malagueta and La Caleta, consist of rather dark sand and are heavily frequented by the local population, whereas the beaches in the east of the city (Pedregalejo, El Palo until Peñón del Cuervo) are clearly less busy, changing gradually from flat beaches with fine sand to steep coasts with rocky underground and small deserted bays.